A urinary tract infection, or UTI, is an infection that occurs anywhere along your urinary tract, including your kidneys, ureters, bladder or urethra. 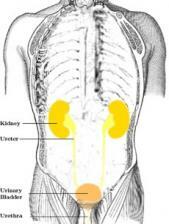 Many urinary tract infections occur along the lower parts of the urinary tract, especially in the bladder and urethra, and can be painful and annoying, but more urgent care should be taken if it were to spread up into the kidneys. It is common to have some sort of urinary tract infection treatment before this happens. If you begin to notice any or all of these symptoms, it may be time to consider visiting a doctor. When you go to a doctor with urinary tract infection symptoms, you can expect them to do one, or a few, minor tests. They will commonly take a urine sample for analysis, perform a culture of the bacteria present in the urine, and if you have recurring infections, perform a cystoscopy to see inside of the urethra and bladder. Once the doctor has determined you do indeed have an infection, treatment can begin. Because a UTI is a bacterial infection, doctors will commonly use an antibiotic for a urinary tract infection treatment. Symptoms will typically start to clear with a few days of treatment, but antibiotics may be taken for a week or more to be safe. Other ways of fighting a UTI at home, before, during or after you start antibiotics include drinking plenty of water, avoiding drinks that may irritate your bladder (coffee, alcohol, soft drinks, citrus juices, etc), and the use of a heating pad. A family doctor would be able to perform these test make prescribe the antibiotic, but if you are in a crunch for time, patients can visit their local FastMed Urgent Care center for any urinary tract infection treatments.